Cannot turn on the reader. Difficulties in turning on the reader may be due to the battery being completely depleted or moisture condensation. 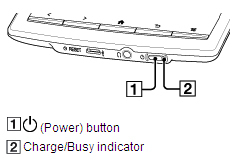 If the battery is completely depleted, power will not be supplied to the button and you may not be able to turn on the Reader. In this case, the Charge/Busy indicator may blink red 3 times. Connect the Reader to your computer via the supplied USB cable, the Reader will automatically turn on approximately 5 minutes later. Wait until the Reader turns on before trying to operate it. Moisture condensation may have occurred. Wait for a few hours and then turn on the Reader.